New Chief Justice of India (CJI): Supreme Court Judge P. Sathasivam took oath as the new Chief Justice of India (CJI). President Pranab Mukherjee administered the oath of office and secrecy to Sathasivam at Rashtrapati Bhawan. Sathasivam succeeded CJI Altamas Kabir, whose last day in office was Thursday. The 64-year-old Sathasivam joined as a permanent judge of the Madras High Court in January 1996. He was transferred to the Punjab High Court in April 2007, and became a Supreme Court judge on August 21 2007. 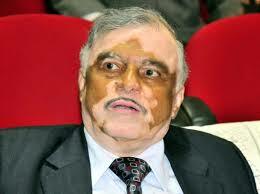 Sathasivam will remain in office till April 26, 2014. Justice Sathasivam, 64, is the 40th CJI and the first from Tamil Nadu. He will remain in office till April 26, 2014. He succeeded CJI Altamas Kabir, whose last day in office was on Thursday. The oath taking ceremony was attended by Prime Minister Manmohan Singh and other dignitaries at Rashtrapati Bhavan.